In the sports world this month may be referred to as March Madness, but in the world of schools it is March Marvels. March is a marvelous month for children and teachers alike because this is the time of year we traditionally see great spurts of growth in our children, both physically and academically. They are taller, speak more eloquently, and can read, write and compute at new levels of achievement. And teachers can marvel that all their efforts are paying off. With this in mind we thought we would share some charts that celebrate effort and expectations as we head forward towards Spring. For most teachers increasing children’s reading stamina is an ongoing goal because of its importance in strengthening their reading abilities and fluency. 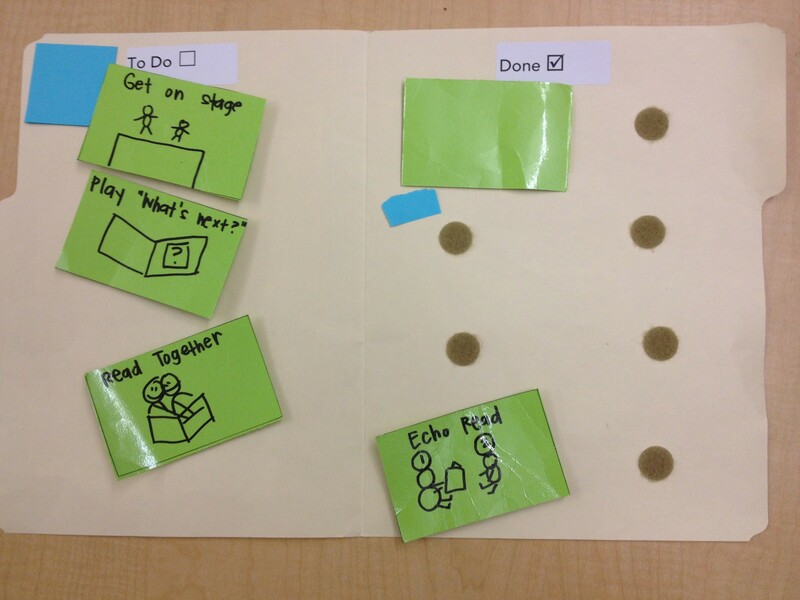 In fact it is often something that was fussed over quite a bit at the beginning of the year as routines and expectations for reading workshop time were set up. 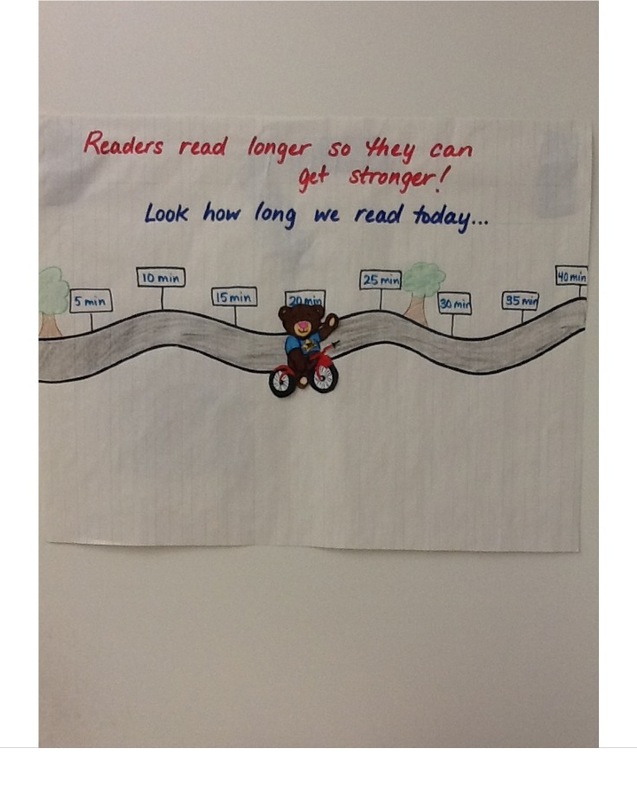 We saw many a stamina reading chart hanging up in classrooms during these beginning months of school. 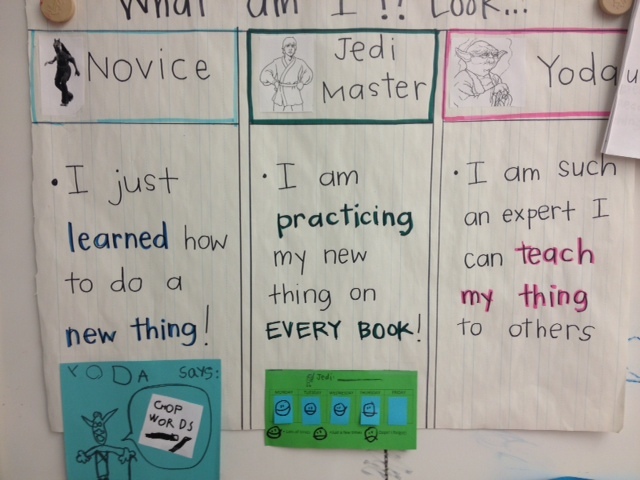 But, as with most charts from the beginning of the year they were replaced by more current charts that focused on critical reading strategies and skills. 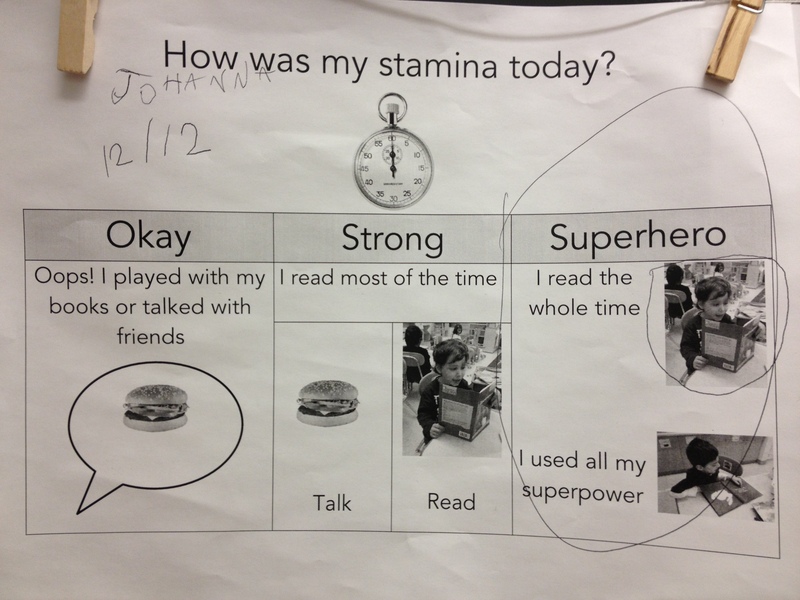 But as students are preparing to read more difficult and varied texts the issue of stamina is one worth revisiting. 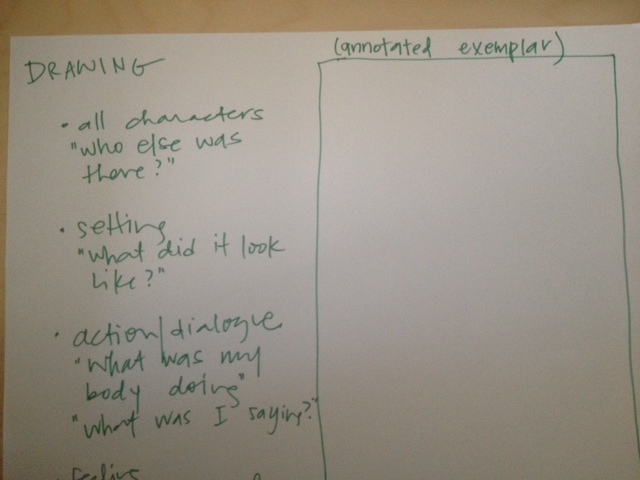 Making a chart that records the increasing time spent reading (or writing) announces to the world that this is something important and increasing the time reading books is worth striving towards as a class. 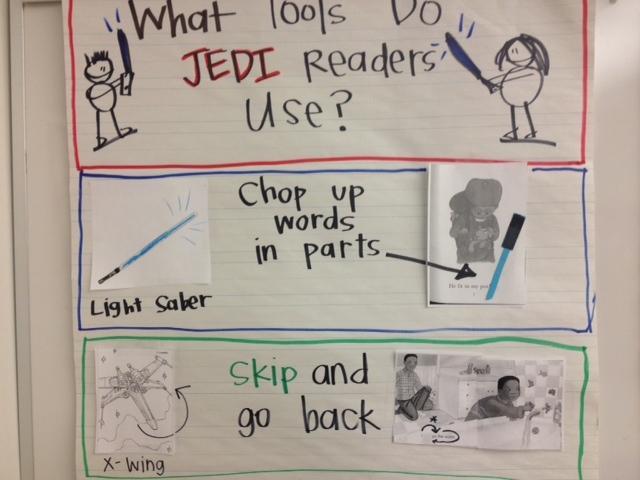 Below we show some examples of charts that celebrate the effort being put forth by classrooms to increase their time reading books. 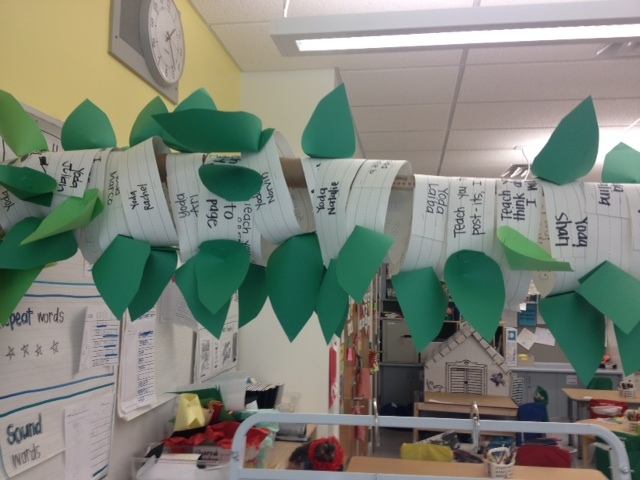 Again, the message being put forth is that this is something important and that together we can accomplish great things and we thank the amazing teachers, Jung Choe, first grade, and CTT team Sarah Carolan and Lindsay Brickell, at PS 59 for sharing these with us. This first chart shows a delightful bear on a bicycle riding on a meandering path. 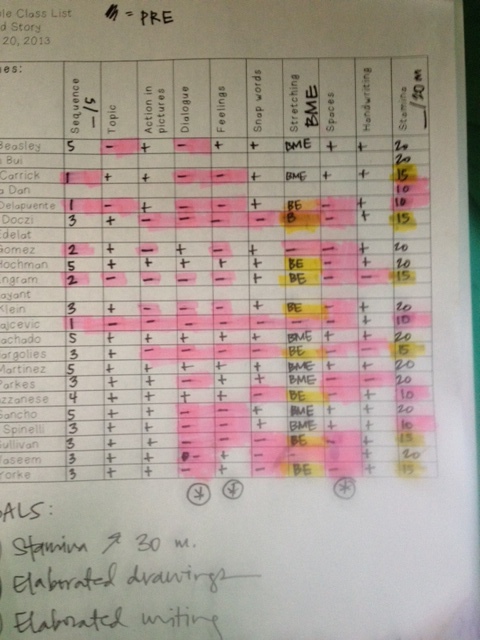 The markers show the times achieved, the current reading times, and the times the class hopes to reach. This chart did not just arrive one day because it was cute and fun. This CTT/Inclusion class spent time talking about their reading, how long they used to read for, how long they can now read for, and what it was like to keep reading even when they got tired or distracted. Together they decided to try to increase their time reading like they try to ride for longer times on their bicycles in the park. The road represents the journey the class is traveling. 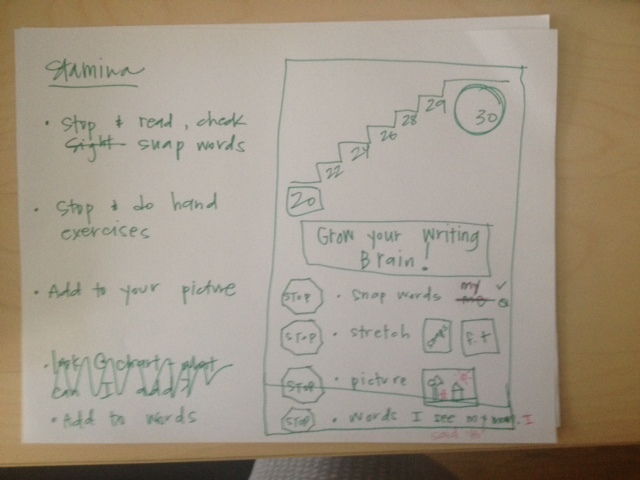 In another first grade classroom the teacher used a favorite character, Pigeon from the Mo Willems series, to pump up her children’s enthusiasm for the challenge ahead – to read longer without stopping. 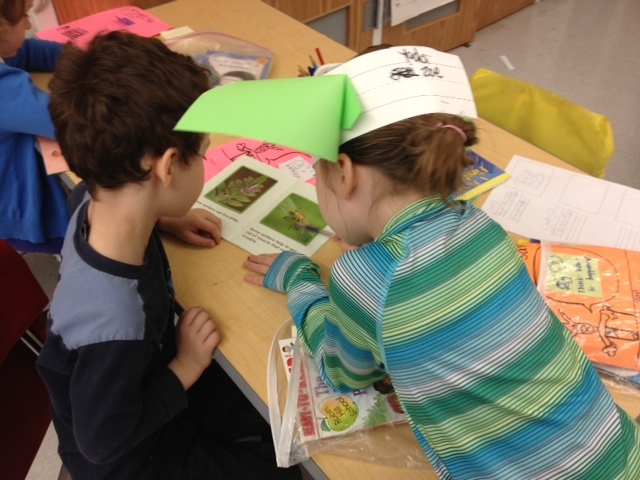 Again, the goals were developed with the children and they took turns keeping track of their reading stamina. 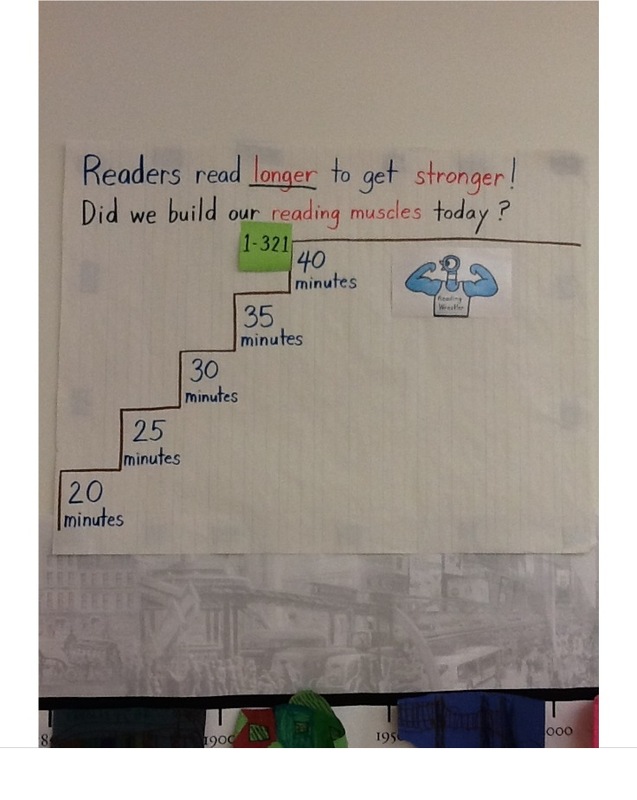 This is a chart that is referred to often and steps moved up when the class is able to maintain the increased time consistently for the week. 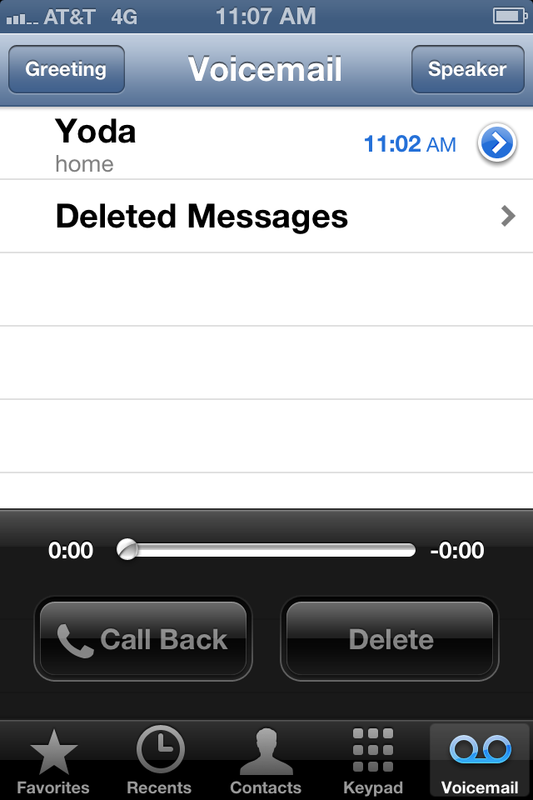 In other words, this is not something we do once, give a shout out, and call it a day. This is something that will take time to become a habit, to reach a goal. It requires effort. The combination of the wrestling pigeon and the staircase reinforces the goals being set forth. 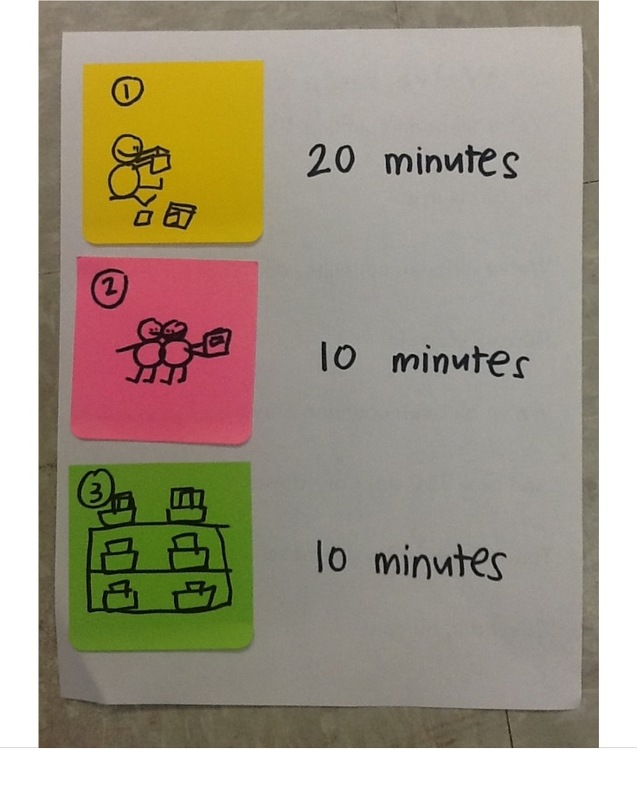 Kristi also found a need to increase reading stamina among her students, so she created with her class of Kinders a plan that increases stamina by reading in increasing increments of time by including independent reading, partner reading, and library reading time. By providing varied opportunities to read in various situations, the children are encouraged to keep reading for increasingly longer periods of time. Again, the more children read, the longer they read for, and this increases their ability to read successfully and well. 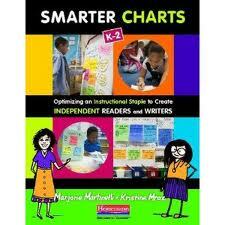 It also allows the teacher increased time to confer and teach small groups. 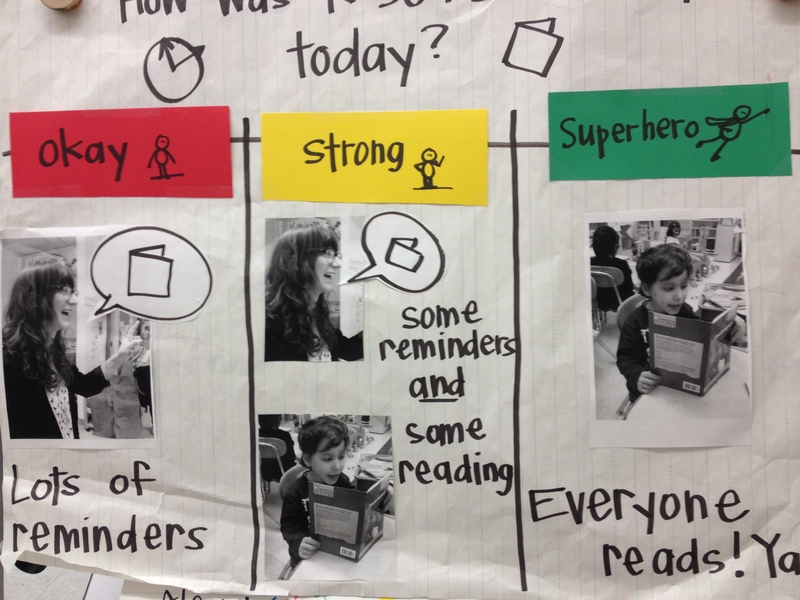 This chart reminds children of their intermediary goals as they continue to read during reading workshop. These are but a few examples of how teachers are setting challenges and celebrating effort in order to help their students, not only set goals, but develop agency and a ‘can do’ attitude that will be a life skill that each and every child can carry with them throughout their life. 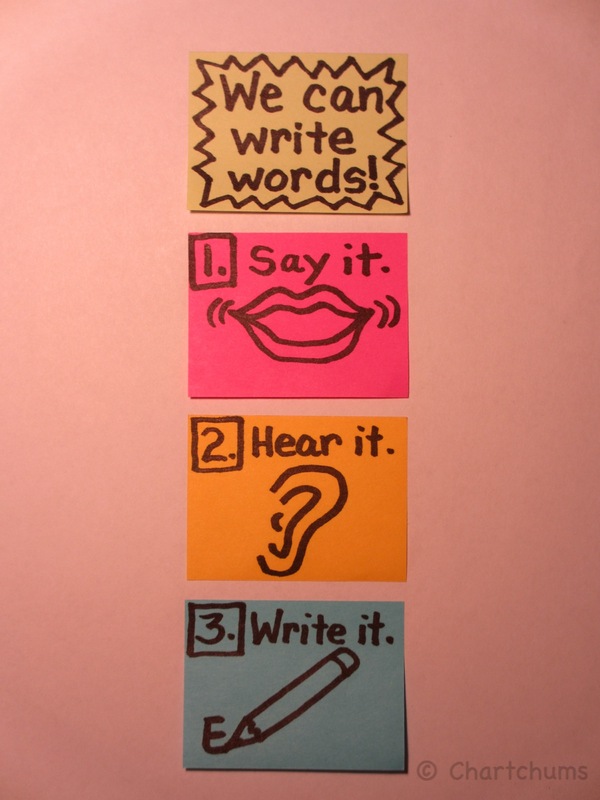 Let us know what other ways you are sparking your students to increase effort and drive to accomplish set goals. Here at Chartchums we are excited once again to have a guest blogger. 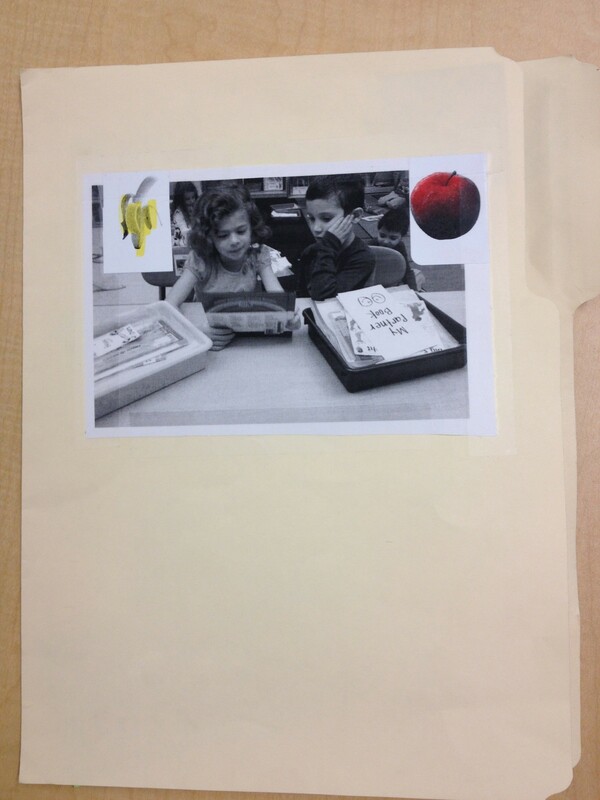 This week we will hear from Bianca Adamo Lavey, a staff developer at the Teachers College Reading and Writing Project, who works with the teachers at Holbrook Elementary School in Long Island, New York. 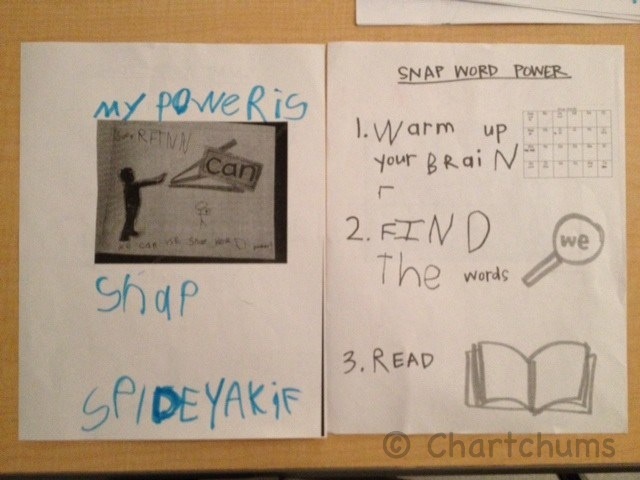 She and the second grade teachers had been doing a lot of work this year on developing children’s independence and were inspired by last week’s blog to make this work not only visual, but also interactive. 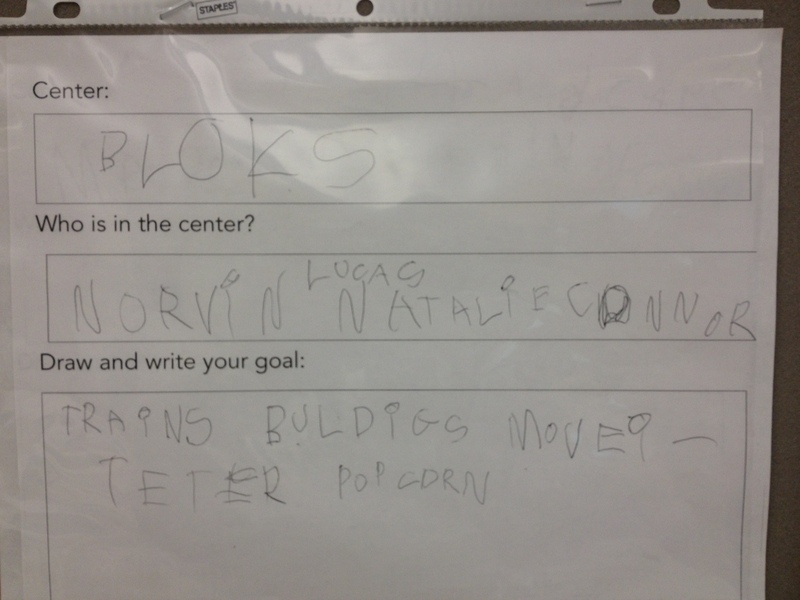 What follows is her description of what the teachers thought and did as they continued this pursuit. 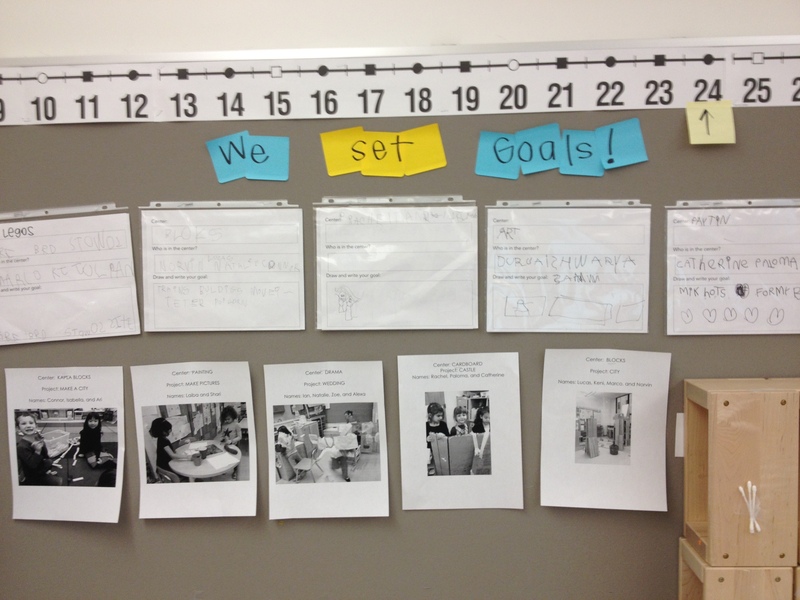 I am so excited to share how teachers at Holbrook Road School were inspired by the idea of goal setting and rubrics written about in the Chartchums blog post, Goals, Rubrics, and Bears…Oh My! posted last week. 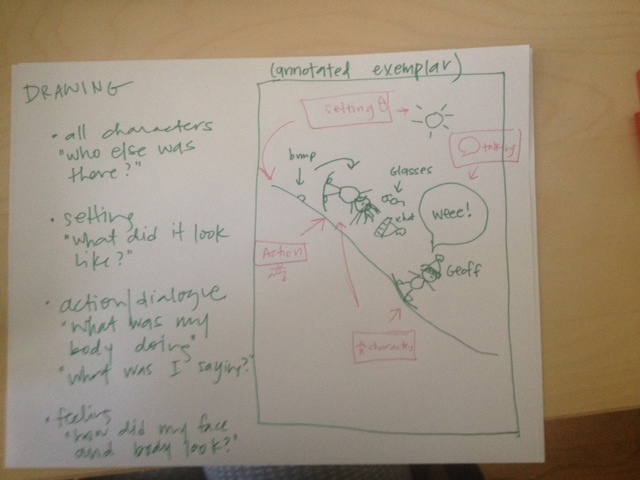 It struck a cord because they too had been thinking about ways to help their students reflect, self-assess and set goals, but weren’t quite sure how best to go about it. 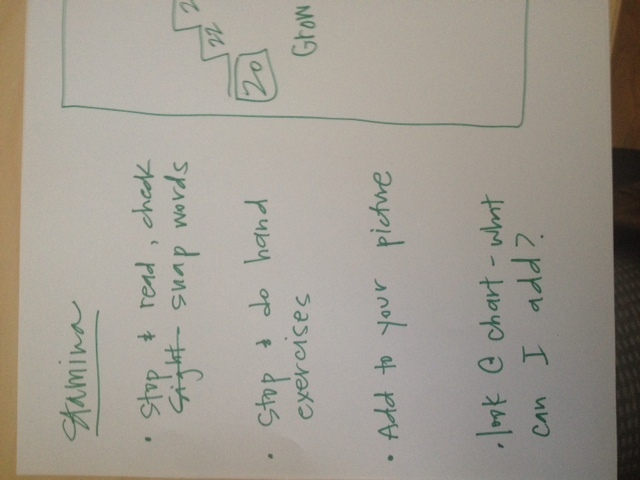 The charts and rubrics shared by the teachers at PS 277 and PS 109 were just the thing to get all of us thinking and talking about how we might create some versions that would work with our kids. The second grade teachers, along with the help of reading teachers, Jen DeHayes and Jen Groen, got together and began to articulate their wishes and wants for the students under their care. 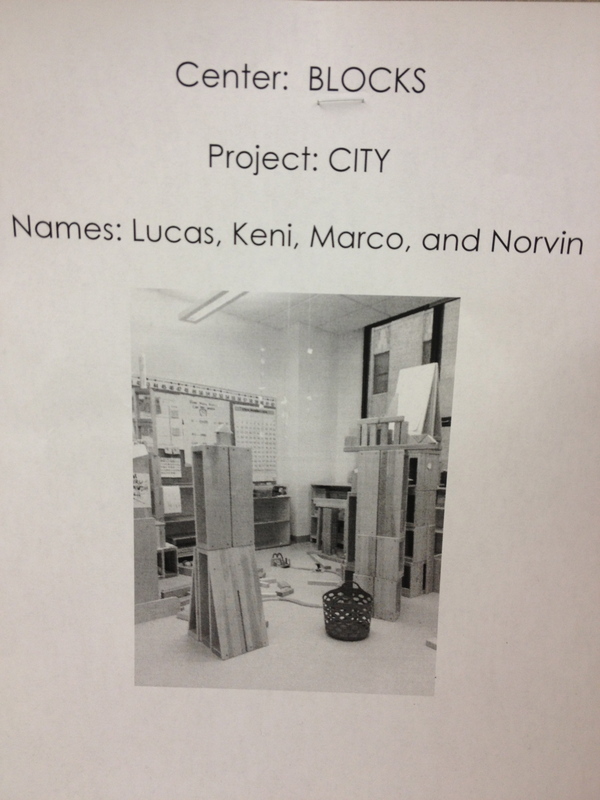 One big goal the teachers had this year was getting the kids to make the best use of partnership time and seeing this time not just as a place to give your ideas, but as a place to get and grow ideas. 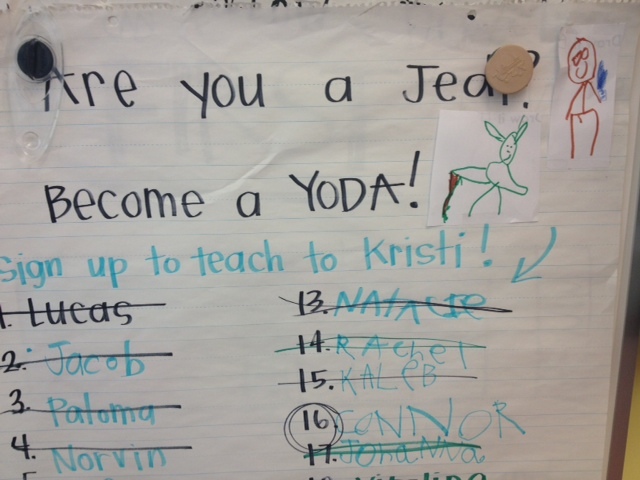 The teacher in this classroom, Julie Kelly, outlined some of the big goals her class has accomplished so far this year and then explicitly told kids what she’s noticed as possible next steps. 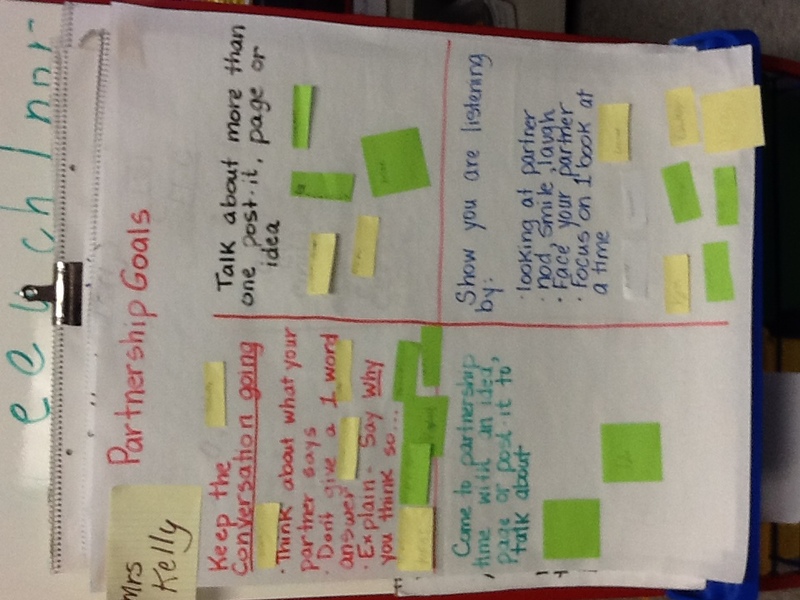 Readers first reflected on what partnership time was like for them, asking themselves what they felt like they were doing well and what they felt like they could work on, looking to the goals chart for help. Partners also provided some feedback to each other and many kids decided to set partnership goals for them to work on together, rather than set different individual goals. 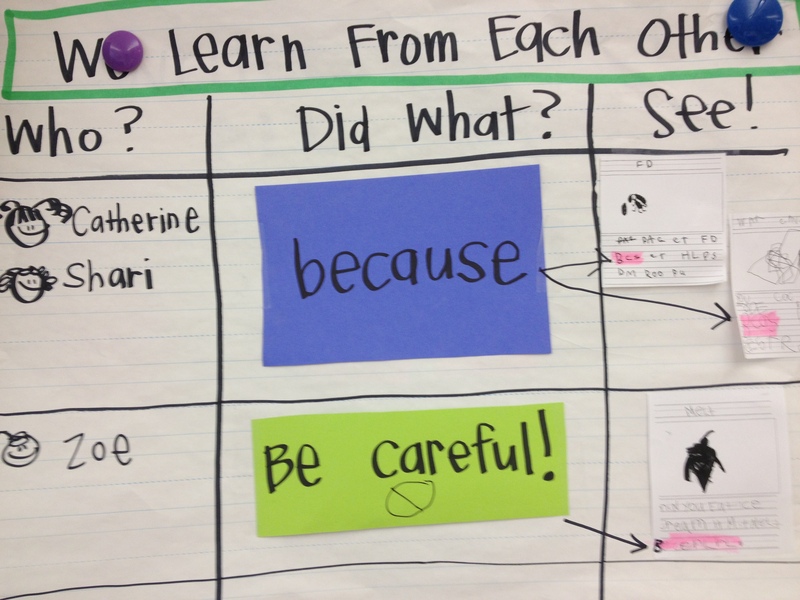 Then her teaching assistant, Arlene Leporati, helped organize this information on a chart so it was clear and easily accessible. 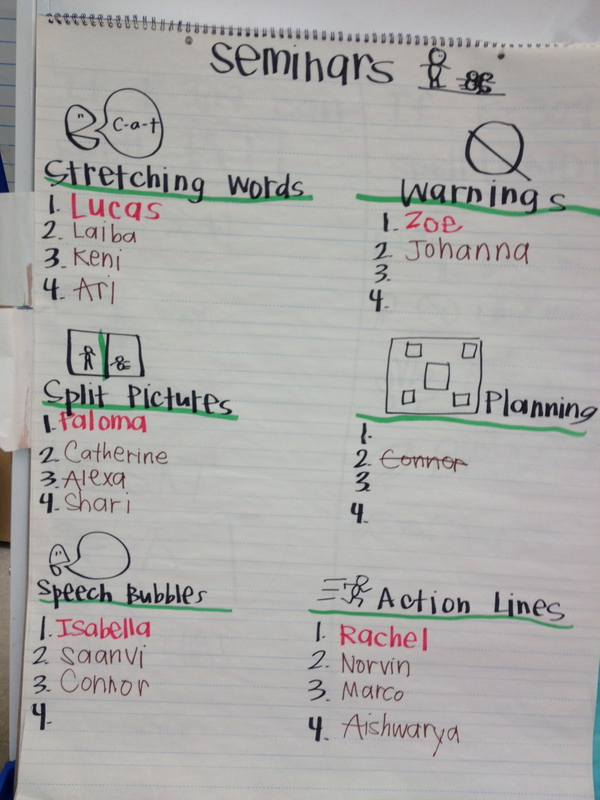 Julie then looked to the chart as a way to form some small groups. 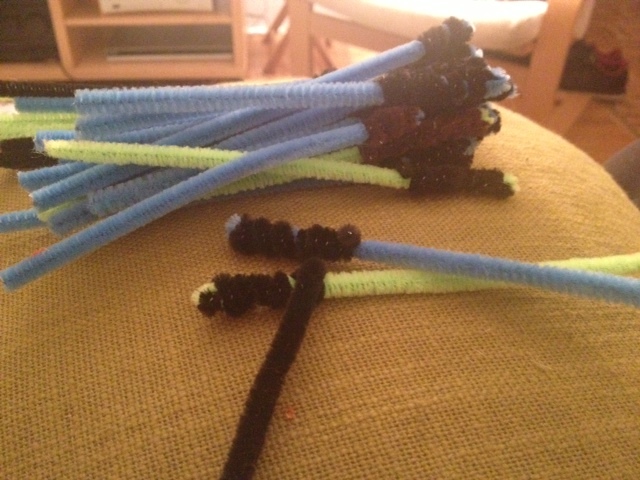 She realized that although many of the readers in her class were quite aware about what things they needed to work on, they probably didn’t know exactly how to work on them. 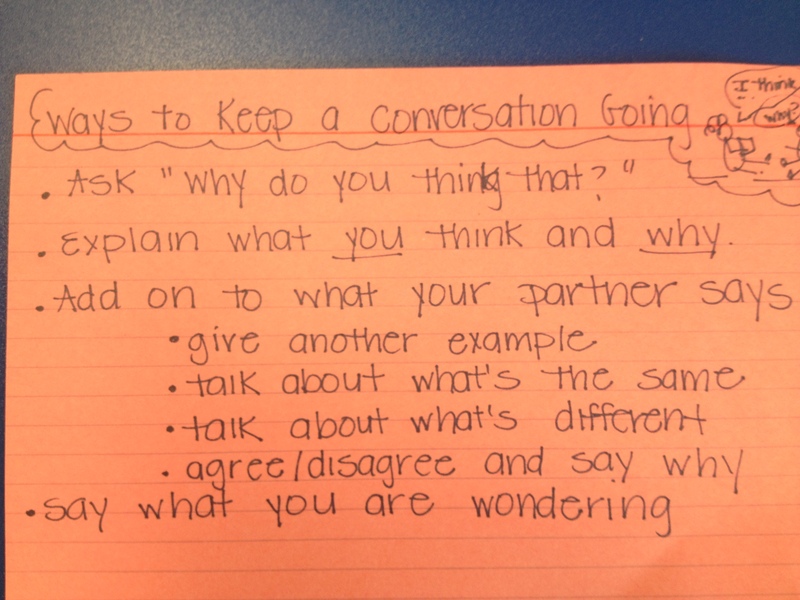 The strategy card above was given to the readers who wanted to work on “keeping the conversation going” during partnership time. 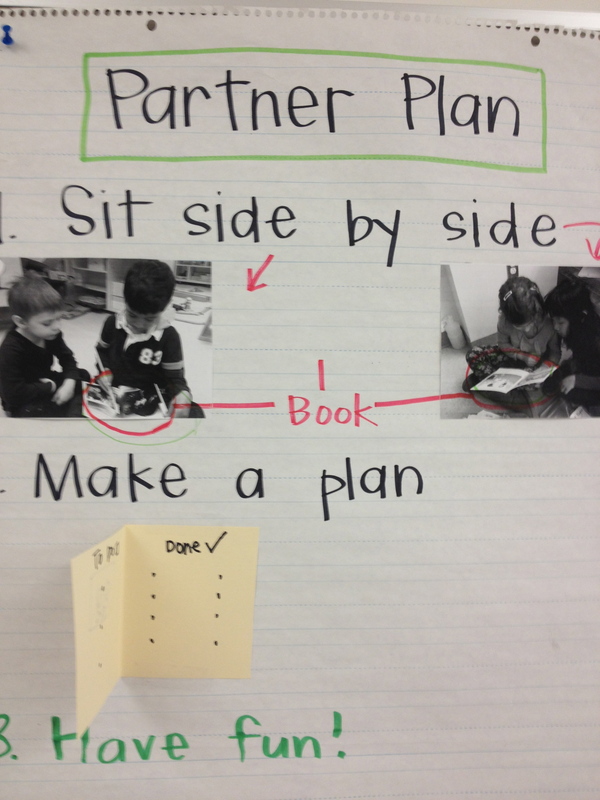 Before partnership time they reflected on which of these strategies they had used in the past and made a plan for which ones they wanted to try today. During partnership time, they took the card out and referred back to it for tips. 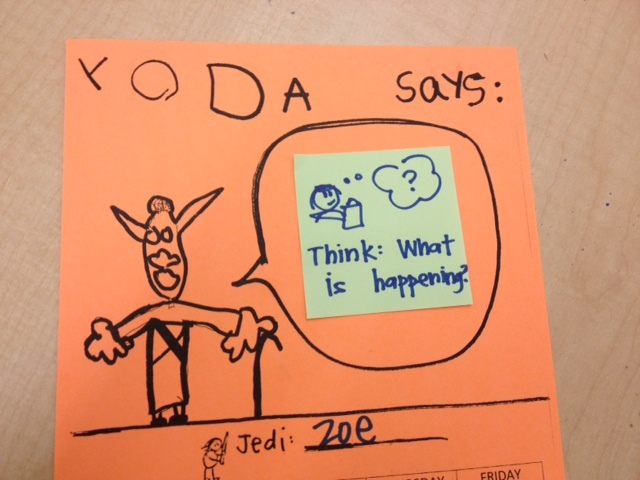 Another goal the 2nd grade teachers had centered around getting kids to think in more sophisticated ways about their books and to show these thoughts with their jottings on sticky notes. 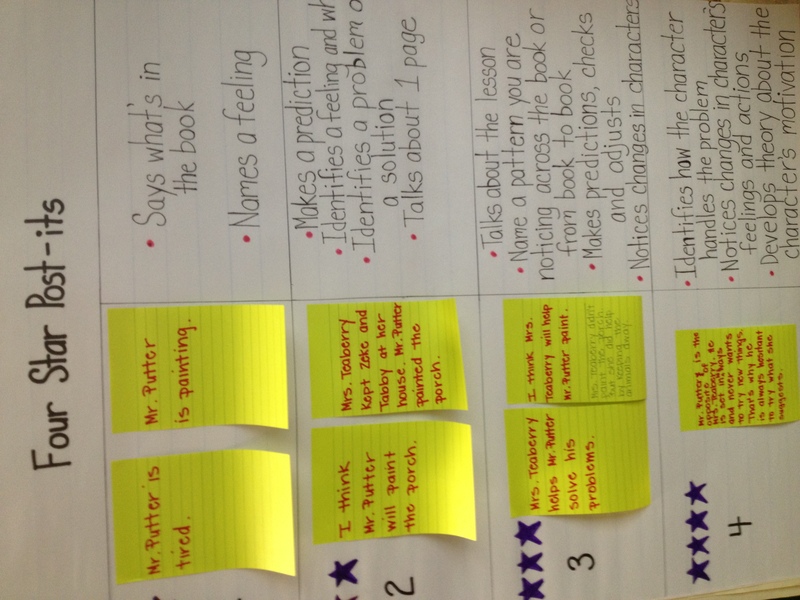 So, we decided to look to what kids were thinking and jotting, create a rubric designed to help the kids work in more sophisticated ways, and then have kids look to their sticky notes to reflect and set goals. 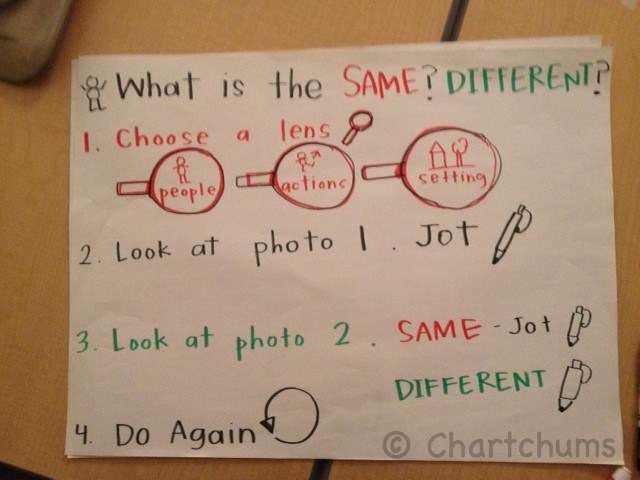 You’ll see from this chart that it is designed in a way to make it easy for the kids to think about where they are on the rubric. 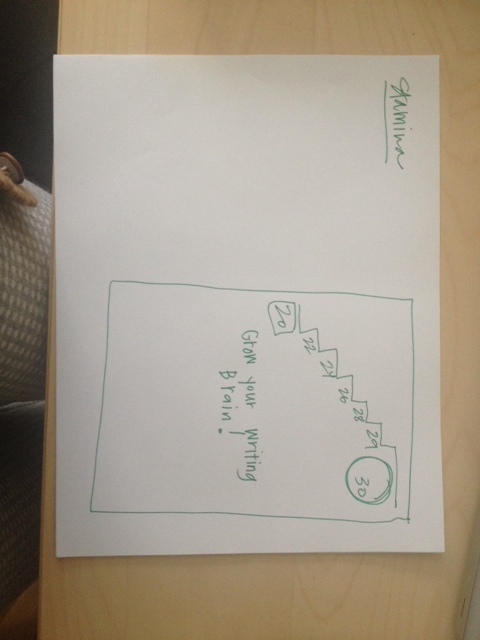 It also makes it easy for the kids to learn ways to move up to the next level. 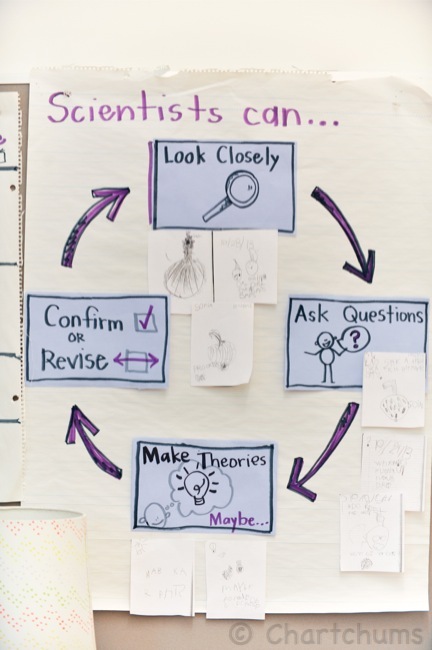 Once they match up their post it to the one on the chart, they can look to the next level and read the strategies listed to learn how to deepen their thinking and even set new goals. I feel honored to share what these awesome, thoughtful teachers are doing to create such reflective, involved students. And we are honored to hear from all of the teachers out there who are doing so much to make teaching matter. 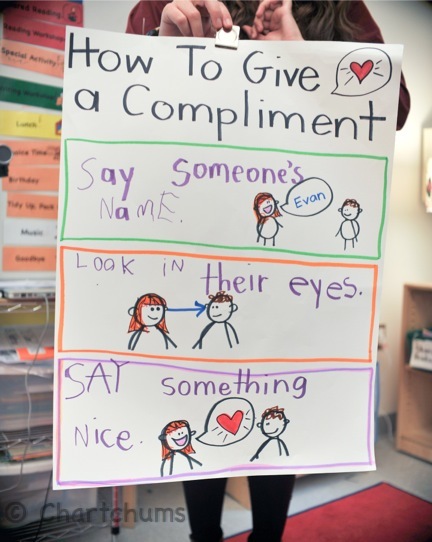 We are also thinking about how the above ideas can easily be applied to other subject areas where children talk with partners and create goals for themselves like, math, social studies, gym, art, music, science . . . the list is endless. Happy Mother’s Day and Happy Charting!